This week’s storytime theme was the color brown. The children enjoyed the book Brown: Seeing Brown All Around Us by Michael Dahl. The children looked at each other’s eyes and talked about their eye colors as we read the page featuring brown eyes. Here’s a link to exploring eye colors in families. The book featured several delicious brown foods. A great science activity to pair with the color brown would be to create sensory containers with a variety of brown spices and flavors such as cinnamon and cloves, or coffee and cocoa. Here is a link to instructions and other sensory ideas. This book also included a fun recipe for peanut butter clay. Owls and the color orange were two of my recent storytime themes. I did a fun preschool activity with the book Wow, Said the Owl. It’s an engaging picture book about an owl that stays up during the day and sees all kinds of beautiful colors. I asked two of the preschoolers to hold a long piece of twine, and handed out colored clothespins for the other children to pin on as I read about the colors. The book ended with a rainbow, and the children were happy to see the rainbow they had made with their many colors of clothespins. Another fun activity to go with this theme is called Light and rainbows, found in the book 365 Science Activities. On a sunny day, hold a glass of water up to the sunlight and over a white piece of paper. When the light shines through water, it splits into the colors of the rainbow. You can also have the children paint the colors right on the paper. If it’s not sunny, you can shine a flashlight through the glass of water in a dark room to make a rainbow as well. There are several other rainbow activities in the book, such as Sky in a jar, Rainbow bath, Outdoor rainbow, and Rainbow paper. A spectroscope is an instrument used to split light into different wavelengths, which we see as different colors of the rainbow. For the color orange storytime, the children enjoyed the book Waiting for Wings by Lois Ehlert. This beautifully illustrated and colorful picture book shares the life cycle of four common butterflies from eggs to caterpillars and their transformation into butterflies. The book includes butterfly and flower facts and identification tips, as well as a guide to planting a butterfly garden. 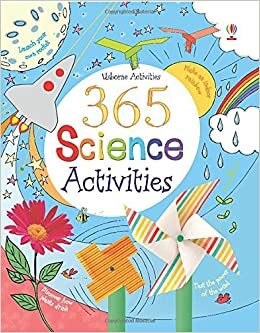 An activity that would pair well with this book is an experiment from 365 Science Activities called Paper, wood and water. Cut out simple flower shapes from paper, card stock and paper towels, fold them, and then watch them unfold as you add water. The paper fibers absorb water and expand, pushing open the flower petals. Chromatography is about separating mixtures. Coffee filters are used to separate the various pigments in markers to see how each color was created. After the experiment the colored filters can be used to create butterfly art.